Will chemotherapy affect my everyday life? Chemotherapy treatment is the use of cytotoxic (cell-killing) medicines to destroy cancer cells. It is an important treatment option for many types of cancer. Click here for a list of chemotherapy drugs commonly used for pancreatic cancer. You may have chemotherapy on its own or alongside other treatments such as radiotherapy or surgery. Usually you will be given chemotherapy by injection into a vein (intravenous). You may also be able to take certain types of chemotherapy as tablets or capsules by mouth (orally). Drugs taken orally are absorbed into the blood from your digestive system. The medicine is distributed to the fast growing cells in your body, therefore is sometimes called systemic therapy. The majority of chemotherapies for pancreatic cancer are given as an out-patient, however this depends on the type of chemotherapy prescribed. It is sometimes possible to have chemotherapy at home. Your oncologist will discuss with you how and where you will have your chemotherapy and any possible side-effects. To prolong life and to treat symptoms. To prevent the cancer coming back after surgery or radiotherapy. The aim is to reduce the risk of the cancer coming back. This is called adjuvant therapy. To reduce the size of a cancer. Chemotherapy can be used to shrink the tumour in the pancreas before surgery or radiotherapy can be considered. This is called neo-adjuvant therapy. To shrink a cancer in order to control symptoms. In this case chemotherapy can be given to try to prolong and improve quality of life. To increase the effectiveness of radiotherapy treatment. Chemotherapy can be used alongside radiotherapy to increase the chance of treatment being effective. This combined approach is becoming more common and is known as chemo-radiotherapy. Chemotherapy affects different people in different ways. You may be able to carry on as normal. However, if you have to go into hospital for your treatment, you will need to make changes to your usual routine. If there is a special occasion that you would like to attend, or you want to go on holiday, it may be possible to arrange the timing of your treatment to suit your needs. Your oncologist can tell you whether this is possible. Many people feel tired a lot of the time during and after chemotherapy. If you are recovering from surgery or having radiotherapy as well as chemotherapy you may feel especially tired. If this happens to you, cutting down on the things you don’t really need to do may help. There is some evidence that exercise of low to moderate intensity may help to substantially reduce this tiredness. It is best not to overdo it. Do as much as you think you can manage and make sure you get enough rest and sleep. While having your chemotherapy, you may find that you are able to carry on doing everything as normal but if you work you may need some time off. How often you have your treatment and how long it takes depends on the type of cancer you have, the drugs you are taking, how well the disease responds to treatment and any side effects that you are experiencing. You may need several courses of chemotherapy. Your oncologist will discuss this with you when he/she takes consent for treatment. The process of consent is important. The oncologist’s job is to ensure you understand what your choices are and that you are happy to proceed with the treatment offered. It may be a good idea to bring someone along with you to that appointment. You will need blood tests before every chemotherapy treatment. This is to check you are fit to have treatment. It may be possible for you to have the blood taken at your GP’s surgery 2-3 days beforehand. This will save you waiting around at the hospital before your chemotherapy can start. If you are unusually afraid of needles and are having difficulty with chemotherapy because of this, please mention it to someone in your specialist team who will work out a way of overcoming this problem. It is important to tell your doctors about any other prescription or over- the-counter medicines you are taking or planning to take, as these may affect how the chemotherapy works in your body. These include herbal remedies and antioxidant and nutritional supplements (such as vitamins and minerals) as well as pharmaceutical treatments. 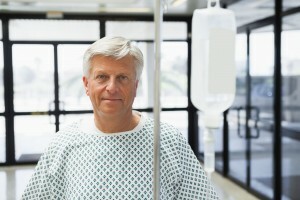 Click here for more information on how chemotherapy is given.